Complete Home Planetarium - Learn the Constellations and the secrets of the night sky! Our Star Theatre 2 Home Planetarium is one of our favourite products, enabling children (and adults!) to learn about the night sky. It is also makes an ideal gift to go alongside one of our telescopes. Star Theater 2's halogen lamp projects hundreds of stars, planets and constellations onto your walls and ceiling. A fascinating CD audio tour hosted by a leading astronomer really helps to bring this product to life. Star Theater 2's halogen lamp projects hundreds of stars, planets and constellations onto your walls and ceiling. You can explore the night sky with a fascinating CD audio tour hosted by a leading astronomer.Use the Star Theatre's built-in compass and easy-to-set dials to accurately replicate the night sky for any time past, present or future! The Star Theatre is supplied with an audio CD which has a 45 minute explanatory commentary. This is a well-balanced mixture of science and the mythology of the classical constellations - in fact it is as professional a commentary as you'd expect in a major planetarium. 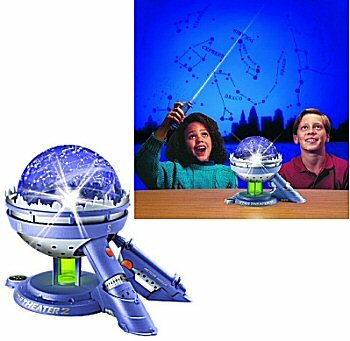 Also included is a hand-held "Meteor Maker" complete with Halley's Comet slide. The next sighting in the sky of the actual comet is around the year 2061, but you can see it in your bedroom tonight! The constellation dome is detachable to allow use outside as a 3D glow-in-the-dark star map. Star Theatre 2 uses three AA batteries for the dome and two for the Comet Maker (batteries not included). Measures 7" x 7" x 6" high. For ages 6 and up. Like any planispheric device, the Star Theatre can be set to show the sky at a given hour of any specific day of the year. The globe is inclined to model the night sky of Northern latitudes (so suitable for the UK and anywhere in Europe), and a compass is built into the base to help align it correctly, so that the stars projected on your ceiling correspond exactly with those you will ll see outside. 2-Dimensional Star Maps, such as those found in books, are useful devices to help amateur astronomers find their way around the night sky, but the 3-dimensional m ap provided by our Star Theatre 2 planetarium makes it far easier for the beginner to understand the workings of the night sky - that is why this product is also purchased by adults, as well as children.